The September meeting was held at Jack Putnam's garage. The treasurer's report was given by Jack Putnam. We had a total of 9 members and 1 guest present. Members that attended the Keystone Cops tour told their story of the tour layout. The tour was put together by Jim Cook and he did a great job. One of the best tours anywhere. People attended from Massachusetts, Connecticut, New York, Pennsylvania, West Virginia, and Ohio. There were a few hills, but the Amish kept them well mowed and the roads were well graded with fresh stone. The Ohio Model T Jamboree held on Labor Day weekend in Mount Vernon was well attended with members from the Northwest Ohio Model T Club. The Tickin' T's of Central Ohio did a great job, Congratulations, a job well done. Bob didn't mention the fact that Dave Benny had brought in his DVD of this year's Jamboree. Jack had a cute little DVD player that he had bought for his grandson to play movies on for long trips. It was ideal for just setting up to run the video in the shop for anyone that was interested. The Video of the Jamboree was taken and formatted by "Red" Staats. He did a great job! Anyone who was on the tour can watch it and relive the entire tour. We also discussed the fact that no club has stepped up to put together the 20the annual Jamboree. Sue Cook will be sending out letters to all of the Ohio clubs to plead for volunteers. Since many of the same people are in both the Tickin' T's and the Northwest club, we are hoping for another club to step forward. An extra year in between would give us a much needed rest and also provide for better planning. It was wonderful to see so many of the Northwest club members at the Old Car Festival this year. It is always a great time at "The Ford". Its that time of year again. 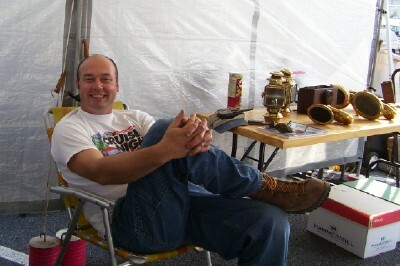 A time to pack up the stuff and head for Hershey, PA for the largest old car swap meet in the world. Here we see Joe Bell as he sells engines in a tent shared with our good friend Whitey Best. The two of them camp out right there on the field so that they are open for business 24 hours per day. 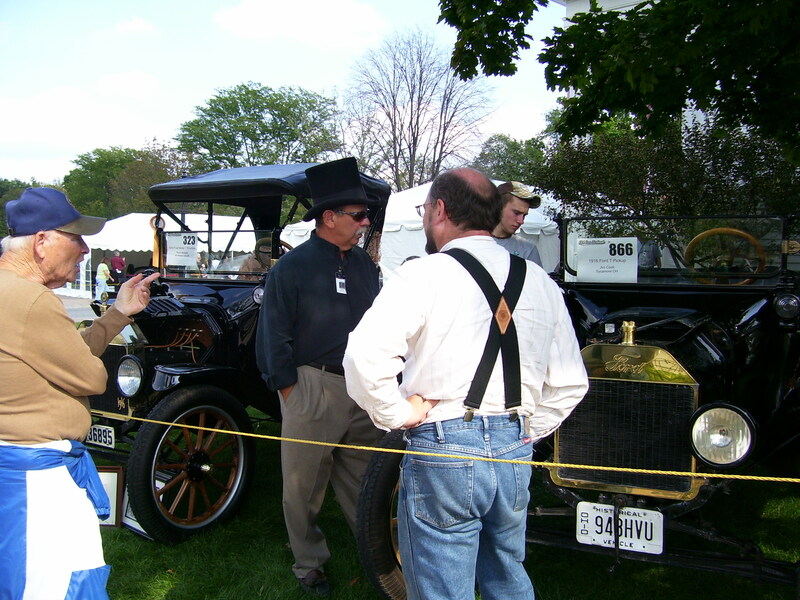 This year at the Old Car Festival, I happened along a gentleman who was telling a story about his 1916 Model T that belonged to his grandfather. The story struck me to the heart because I had the same story except that mine was my great grandfather's car and "Old Henry" had never left the family. I introduced myself to Steve Shotwell and we talked about the feeling involved in holding a part of our family's history. He had named his car "Goosebumps" because that is what happens to him and others every time that he tells the story about how his mother traced the car back through the auctioneer that sold the car and bought it back. The Annual Keystone Cops tour was held in Ohio this year. We spent time touring Amish Country (Holmes County) and the territory to the east and south. 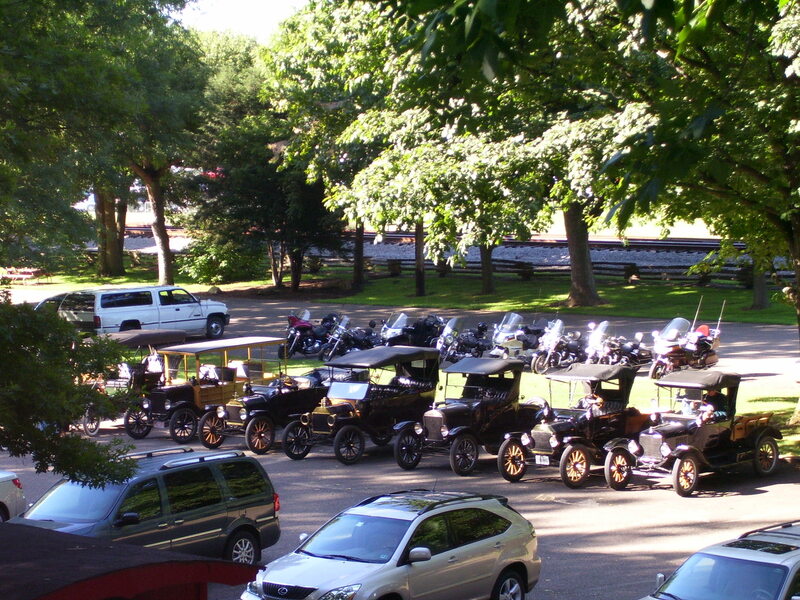 This is the parking lot of the Warther's Carving Museum in Dover, Ohio. If you have never been to Dover to see this man's artistry, you really should make the trip. I have never seen carving like this. I'm not alone in that thought. Every part of the collection isn considered priceless. 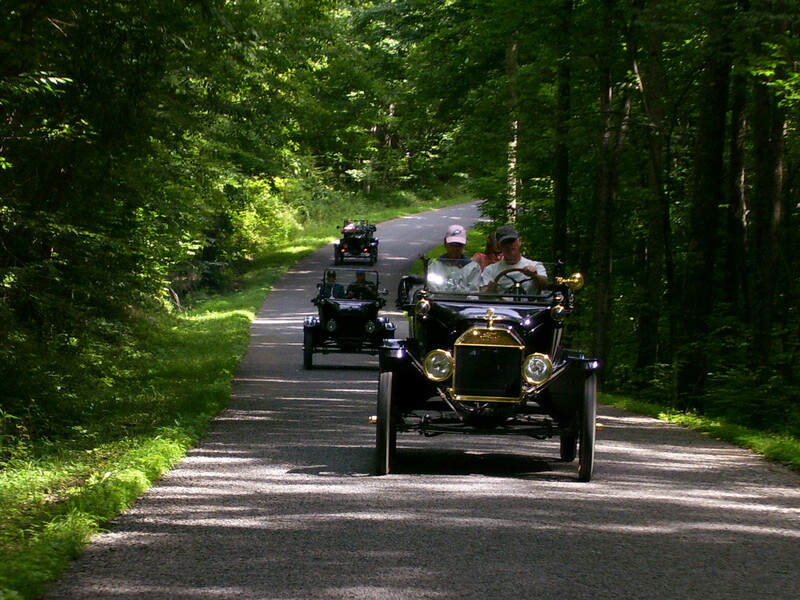 I picked shade tree covered roads with fantastic views for the theme of this Model T tour. It sometimes took quite a climb to get to those views; but, most of the T's got there with little problem. Some of the eastern folks came away with a new found understanding of Ohio Terrain. Some people have the ideas that Ohio is flat. Northwest Ohio is; but, the rest of the state is more like West Virginia. The Friday night meeting on the square in Mount Vernon was one of the highlights of the Jamboree. 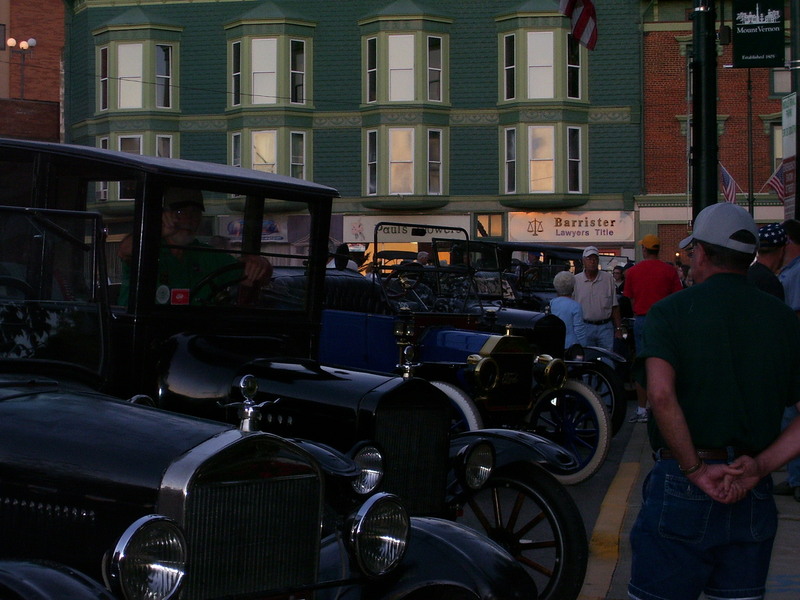 There were over 100 Model T's parked around the square. A banjo player sang some songs from the Model T era and later a bluegrass band provided the entertainment. Free ice cream was there for all. The tours for the event went in every direction out of Mount Vernon. I believe this shady gravel road was on the Sunday tour to Dresden. 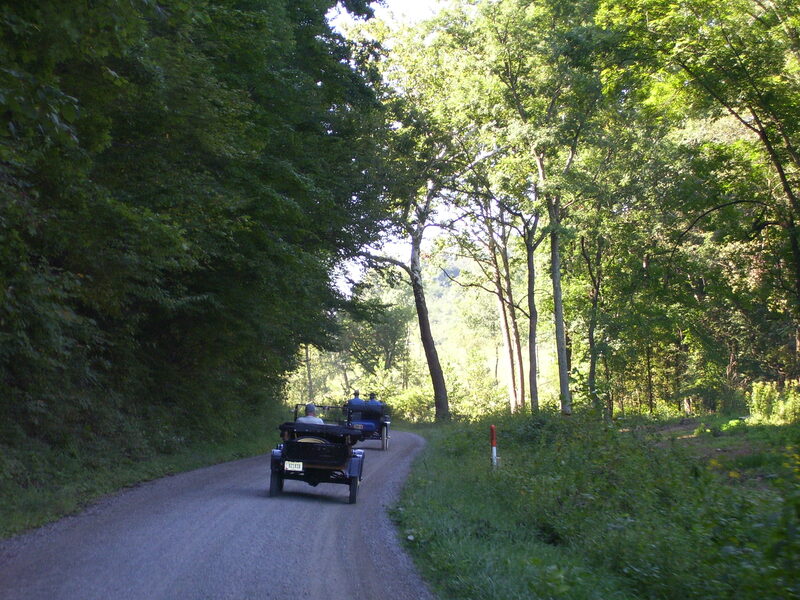 It is relaxing to travel down the backroads of Ohio with other Model T's. We take it easy, enjoy the scenery, somtimes kid with one another, and just have an all around good time. I look forward to next year's tour, wherever it might be. Running a tour is OK; but, its sometimes nice to just sit back and let someone else do all of the work.